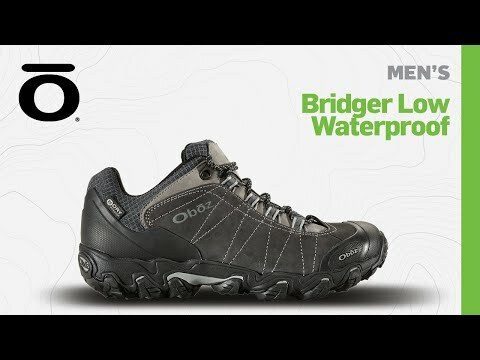 Waterproof shoes for walking in the rain, crossing wide puddles, and stepping through shallow streams. Enjoy dry feet and socks even on wet, windy days. Uppers are waterproof nubuck leather. Oboz BDry waterproof breathable membrane keeps out the wet and lets sweat escape. Rubber toe caps and heel counters protect your feet and boots. BFit Deluxe insoles use three densities of EVA to provide durable cushioning and support. Midsoles are dual-density EVA for cushioning and support. TPU chassis have nylon shanks for stability and protection. Granite Peak soles use high-friction carbon rubber, with asymmetric lugs for traction on loose surfaces.